The Party in the Park royalty and court are pictured with Meigs County Fair Royalty in attendance at the event. Pictured are (seated from left) Party in the Park First Runner-up Kayla Boyer, Queen Marissa Brooker, and candidate Peyton Anderson; (standing from left) 2017 Party in the Park Queen Nikita Wood; candidate Madison Lisle, Fair Livestock Princess Raeann Schagel, Livestock Prince Matthew Jackson, Fair King Austin Rose, Fair First Runner-up Raeven Reedy, and candidate Tori Chaney. First Runner-up Kayla Boyer, Queen Marissa Brooker and 2017 Queen Nikita Wood. 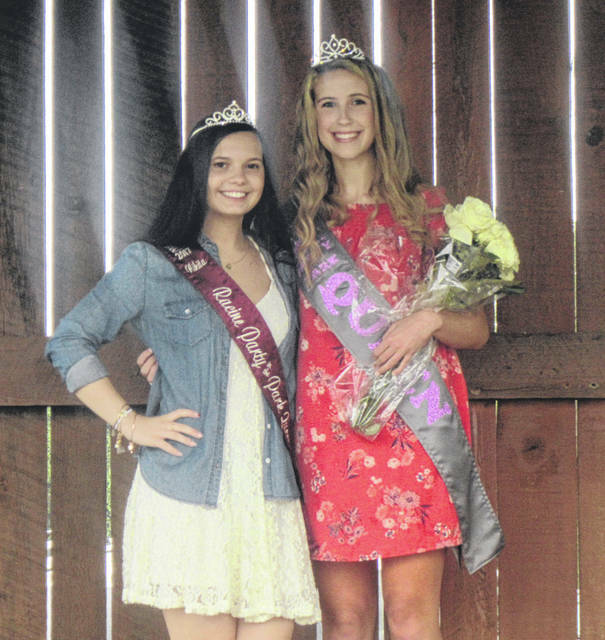 The 2018 Party in the Park Queen Marissa Brooker (right) is pictured with First Runner-up Kayla Boyer. The 2018 Party in the Park Queen and Court are pictured with the 2017 Queen. Pictured (front, from left) are First Runner-up Kayla Boyer, Queen Marissa Brooker, Peyton Anderson, (back, from left) Madison Lisle, 2017 Queen Nikita Wood, and Tori Chaney. The 2017 Party in the Park Queen Nikita Wood and 2018 Party in the Park Queen Marissa Brooker. The 2017 Party in the Park Queen Nikita Wood crowns 2018 Queen Marissa Brooker on Saturday at Racine’s 10th annual Party in the Park. 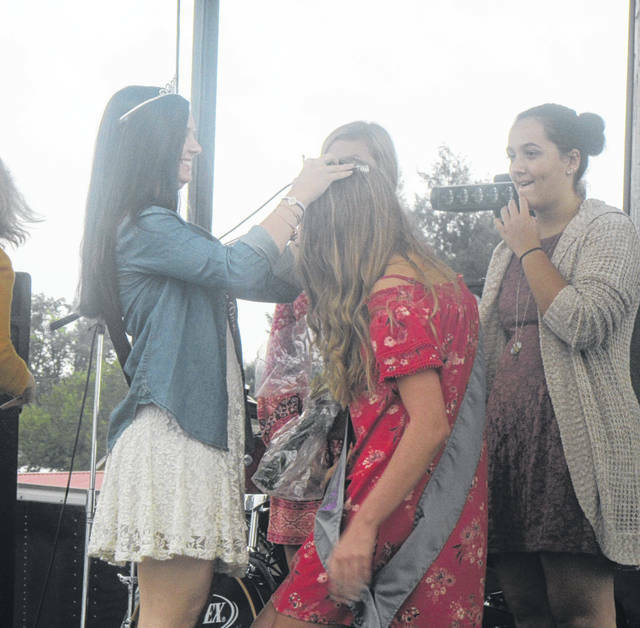 RACINE — Marissa Brooker was crowned the 2018 Racine Party in the Park Queen on Saturday during the three-day festival at Star Mill Park. Brooker is the daughter of Pete and Paula Brooker of Pomeroy. Brooker has been playing volleyball for six years as school and on a travel team. She is also a member of student council, currently serving as president. Brooker plans to attend Ohio State University to major in biology and then attend optometry school. Brooker was crowned by 2017 Party in the Park Queen Nikita Wood. Kayla Boyer, granddaughter of Josie Boyer, was named the First Runner-up. Boyer is a certified nurse assistant who “loves to take care of people who are not able to take care of them self.” She plans to attend Hocking College for nursing and transfer to Marshall University to become a nurse anesthetist. Remaining candidates were Peyton Anderson, Tori Chaney and Madison Lisle. Anderson is the daughter of Jamie and Heidi Anderson. She is president of the National Honor Society and a member of the volleyball team. She plans to attend Ohio State to become a dermatologist. Chaney is the daughter of John Chaney and Christi Essick. She is a waitress at Sikorski’s Family Restaurant in Racine and is head of the Yearbook Club at school. She plans to attend Rio Grande and is undecided on a major. Lisle is the daughter of Todd and Christi Lisle. He favorite activities include running — she has run the Athens half marathon twice — and enjoys volunteering in the community, including helping with Bingo at Overbrook Rehabilitation Center. Each of the five candidates took part in an interview on Friday as part of the judging before the crowning. The girls was also asked about their favorite part of Racine, with the answers shared as part of their respective introductions. “My favorite part about Racine is it is it’s own community. It is like a small town where everyone knows one another. I did not realize until I started working there (Sikorski’s Family Restaurant in Racine) how close everyone was. It is a new and exciting experience that I am glad I am a part of,” said Chaney. Lisle stated, “My favorite thing about the town of Racine is our community. I feel like this is many people’s favorite thing about our small town. I love how we support each other and how we have such special events, such as the Party in the Park, to come together. https://www.mydailysentinel.com/wp-content/uploads/sites/14/2018/09/web1_9.12-PITP-Queen-1_ne201891114656918.jpgThe Party in the Park royalty and court are pictured with Meigs County Fair Royalty in attendance at the event. 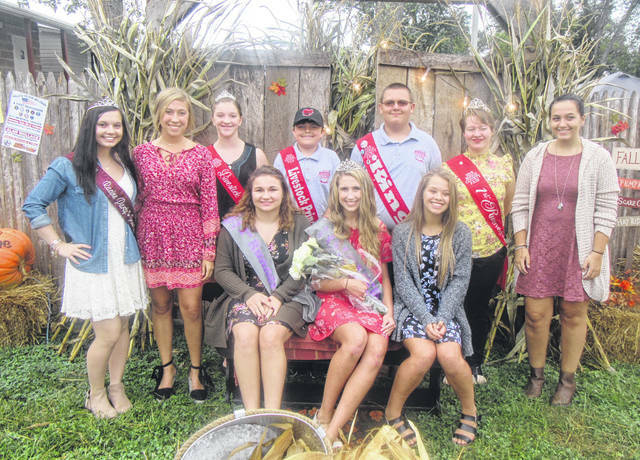 Pictured are (seated from left) Party in the Park First Runner-up Kayla Boyer, Queen Marissa Brooker, and candidate Peyton Anderson; (standing from left) 2017 Party in the Park Queen Nikita Wood; candidate Madison Lisle, Fair Livestock Princess Raeann Schagel, Livestock Prince Matthew Jackson, Fair King Austin Rose, Fair First Runner-up Raeven Reedy, and candidate Tori Chaney. 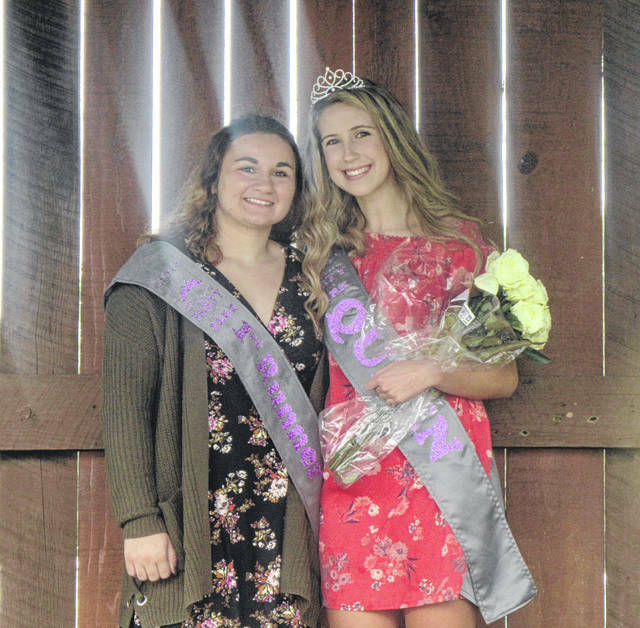 https://www.mydailysentinel.com/wp-content/uploads/sites/14/2018/09/web1_9.12-PITP-QUeen-2_ne201891114740419.jpgFirst Runner-up Kayla Boyer, Queen Marissa Brooker and 2017 Queen Nikita Wood. https://www.mydailysentinel.com/wp-content/uploads/sites/14/2018/09/web1_9.12-PITP-Queen-3_ne201891114822965.jpgThe 2018 Party in the Park Queen Marissa Brooker (right) is pictured with First Runner-up Kayla Boyer. 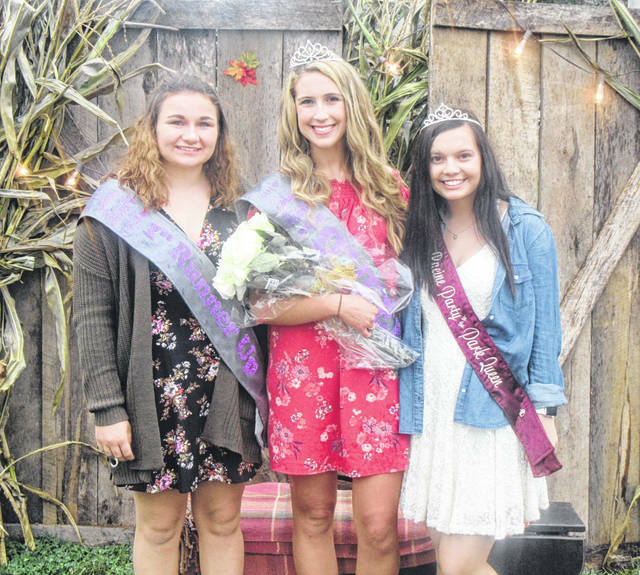 https://www.mydailysentinel.com/wp-content/uploads/sites/14/2018/09/web1_9.12-PITP-Queen-4_ne2018911149695.jpgThe 2018 Party in the Park Queen and Court are pictured with the 2017 Queen. 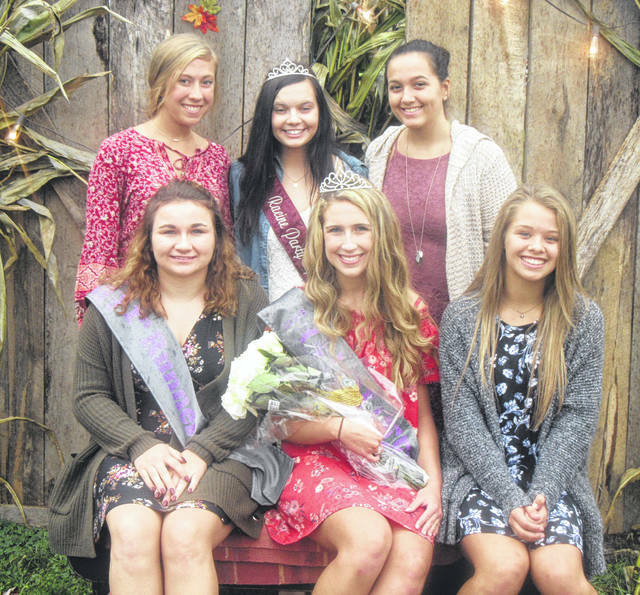 Pictured (front, from left) are First Runner-up Kayla Boyer, Queen Marissa Brooker, Peyton Anderson, (back, from left) Madison Lisle, 2017 Queen Nikita Wood, and Tori Chaney. https://www.mydailysentinel.com/wp-content/uploads/sites/14/2018/09/web1_9.12-PITP-Queen-5_ne201891114945646.jpgThe 2017 Party in the Park Queen Nikita Wood and 2018 Party in the Park Queen Marissa Brooker. https://www.mydailysentinel.com/wp-content/uploads/sites/14/2018/09/web1_9.12-PITP-Queen-6_ne2018911141021996.jpgThe 2017 Party in the Park Queen Nikita Wood crowns 2018 Queen Marissa Brooker on Saturday at Racine’s 10th annual Party in the Park.